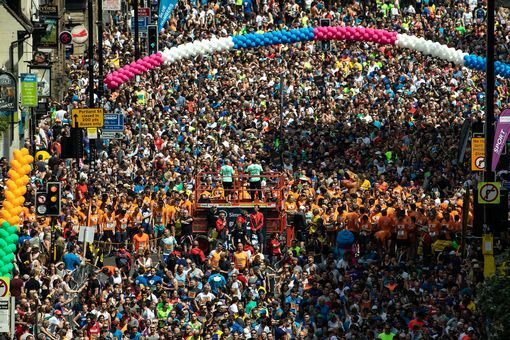 30,000 runners were welcomed to the baking streets of the city centre yesterday for the running festival of the year. The day started off with the half marathon, which runs from the Eithad to Old Trafford. The leading male came in at a time of 1:13:58, despite it reaching 25 degrees. The leading women weren’t far behind in a time of 1:19:30. Following this, the junior runners set off on a completely new route through the city’s streets. And this weather was particularly hot for the mascots who were there to spur them on. This year’s Manchester run came a year after the Manchester Arena attack and the runners held a minute silence for those who were affected by the tragedy. Event Ambassador, Freya Lewis, finished the Junior run after being in a wheelchair for three months following the attack. Martin Hibbert began the 10km in his wheelchair, after being paralysed during the attack. The day was full of emotion but also strength, determination and resilience a year on. At around 1pm, the 10km began, split into waves up until around 3pm. Tirunesh Dibaba won the Elite Women’s race for the 5th time, in an extremely speedy 31:08. Mo Farah beat Moses Kipsiro by one second on the Deansgate sprint finish. He was victorious in a time of 28:27. The 30,000 runners who crossed the three finishing lines were all really the champions. The heat, the distance, the hills: a definite victory.